Daniela Aguilera and Julia Welch are among the top eight teams in the world that will head to Las Vegas in September. Watch how Weatherhead students solve real-world challenges and present their findings to organizations. Daniela Aguilera and Julia Welch advance from the first round of APICS case competition to represent Weatherhead in Atlanta. Get to know the MSM-ORC faculty members who have been nominated by students to win the Teaching Excellence Award. Alumna Jeannie Fanning (MSM-OR/SCM '14) led an initiative to improve the company's recruiting process and reduce turnover using data or "people analytics." The MSM-OR/SCM program qualifies as a STEM degree, which allows international students in a technical field to apply for a 24-month extension to their optional practical training (OPT) period. This means you may be eligible for up to three years of work in the United States. Visit the U.S. government's website for more information on STEM extensions. Have a knack for spotting inefficiencies in systems? Looking for opportunities to make a substantial impact in the way businesses and supply chains run? Do you want to use your quantitative skills to solve real business problems? 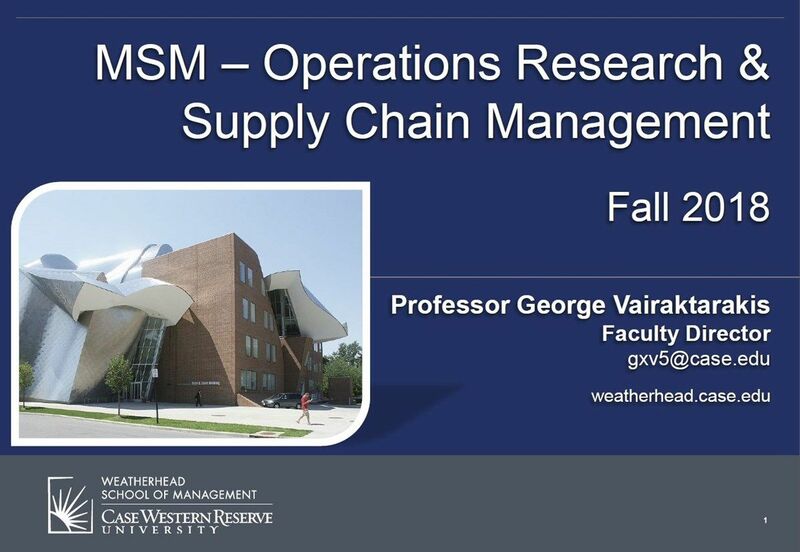 Weatherhead’s renowned Master of Science in Management-Operations Research and Supply Chain Management (MSM-OR/SCM) degree will empower you to make a substantial and measurable impact in national and global operations and supply chain management across a broad range of industries including manufacturing and service industries. MSM graduates have also gone on to serve as consultants for consulting firms. The MSM-OR/SCM curriculum provides students with the fundamentals of business as well as depth and focus in the principles of operations research and supply chain management. This program produces highly knowledgeable professionals well-prepared to make organizations more efficient and competitive. Is this Master’s in Operations Research & Supply Chain Management right for me? OR/SCM students typically have an undergraduate background in the following areas: engineering, statistics, computer science, economics, mathematics and business. Students beginning Weatherhead’s MSM-Operations degree program must have a working knowledge of undergraduate calculus, including differentiation and integration, and one semester of undergraduate linear algebra. Work experience is beneficial but not required for admission; many students pursue the MSM-OR/SCM immediately following the completion of their undergraduate degree. Find essential admission information, such as application requirements, deadlines, and program start dates for Weatherhead’s MSM-Operations program. Ready to start your MSM-Operations degree program? Apply online today.